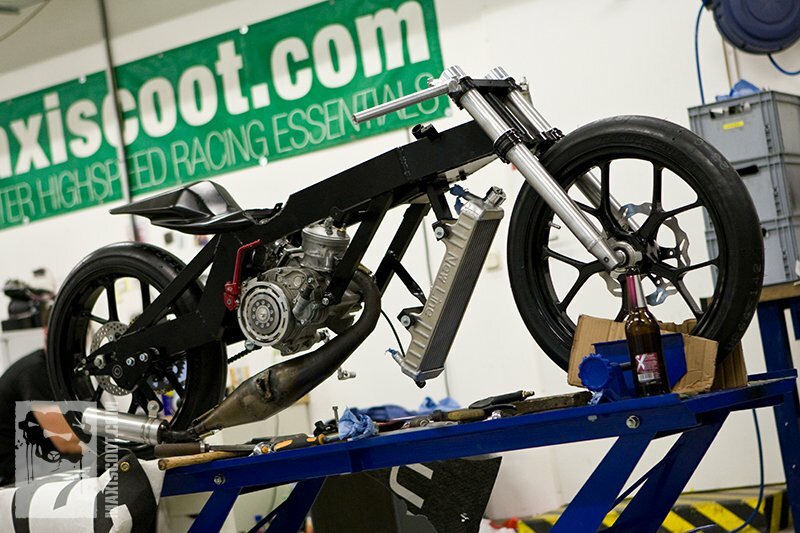 We developed and realized several really impressive custom builds in our MXS Racing workshop. 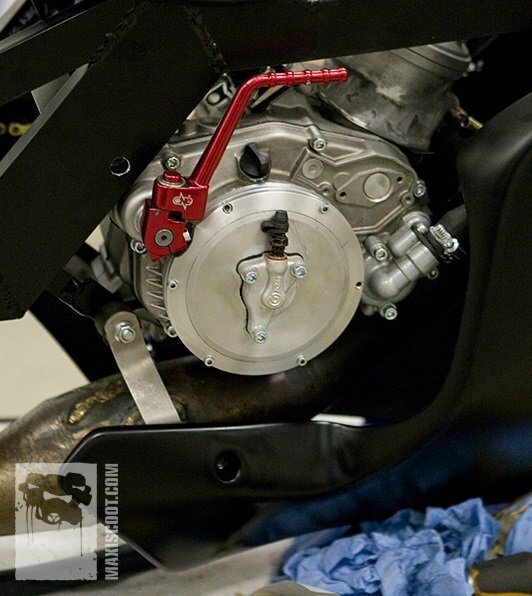 After finishing our last project, a Derbi mainly developed for custom show purposes, we decided to tackle a new project: a custom moped with gearbox for maximum drag race performance. 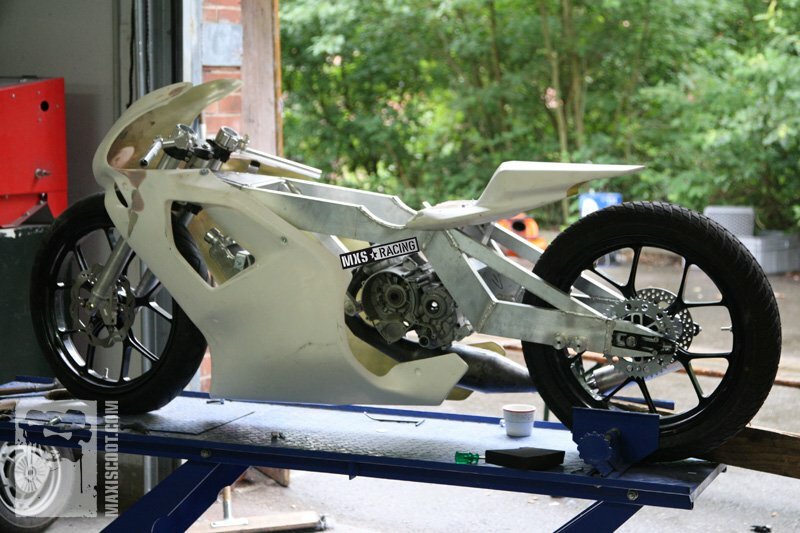 Ultralight frame, high-end chassis components, maximum power engine and 100% racing look constitute the main components of our MXS 90cc drag bike that we managed to build in as little as two weeks. The outcome is definitely nothing for the faint at heart! The MXS 90cc custom build is based on an extremely lightweight aluminium frame that we equipped with a custom-made fork with two BUD Racing fork tubes that were originally mounted on a KTM SX85. We completed the chassis by adding more top quality parts – two stunning looking forged magnesium rims by PVM and high-end 90/580/17 Bridgestone Battlax tires for optimum grip. Now that we had our high-end chassis we were able to boost performance as far as possible. The Minarelli AM6 crankcase was modified to accommodate an MXS GP 90cc cylinder connected to a crankshaft with 46mm stroke and a 90mm connecting rod. 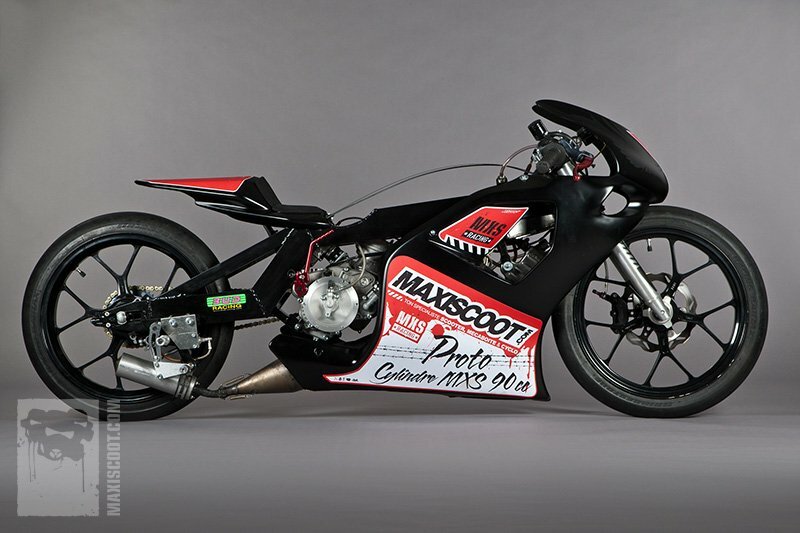 For optimum exhaust gas evacuation we chose a prototype of an MXS Racing exhaust. We added a digital PVL ignition that we programmed with a special MXS ignition advance curve to push engine performance even further. The engine is fuelled by an MXS Racing intake system (prototype version) plus 34mm carburetor by Koso with matching bell mouth. A Metrakit transmission and a custom-made semi-automatic clutch make sure that engine power is transmitted to the wheels at optimal rates. 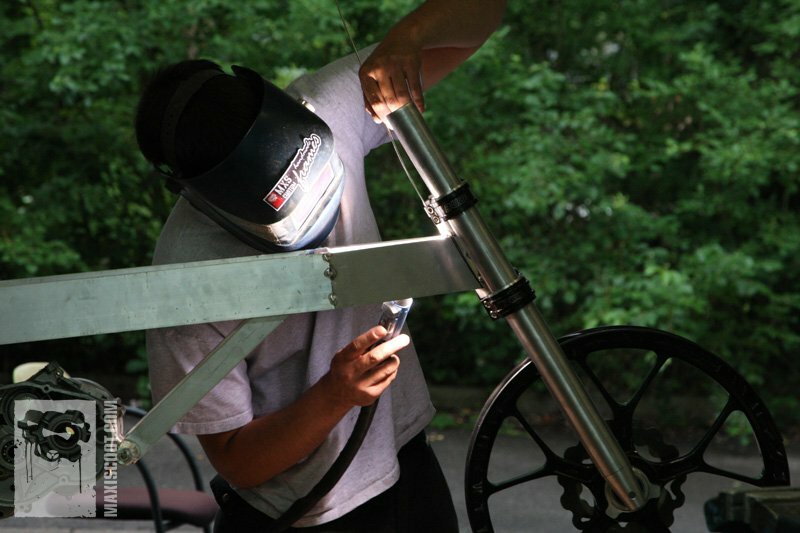 We did not stop here and put a lot of thought, and eventually some top quality high-end parts, into bike design. For the front, we opted for an incredibly stunning looking glassfibre fairing originally mounted on a Aprilia RS 125 built 1998. The tail end fairing panel was taken from Yamaha R6 (slightly modified). Maximum lowering and an extremely wide wheelbase resulted in the ultimate dragster build – it can’t get much better. To enhance the sporty racing character, we gave the frame and fairing panels a beautiful matte black coat, and rounded off the look with decals and stickers. Our purebred drag racing monster MXS 90cc has so far delivered 100% satisfying results, with unbeatable times at every race it participated in. 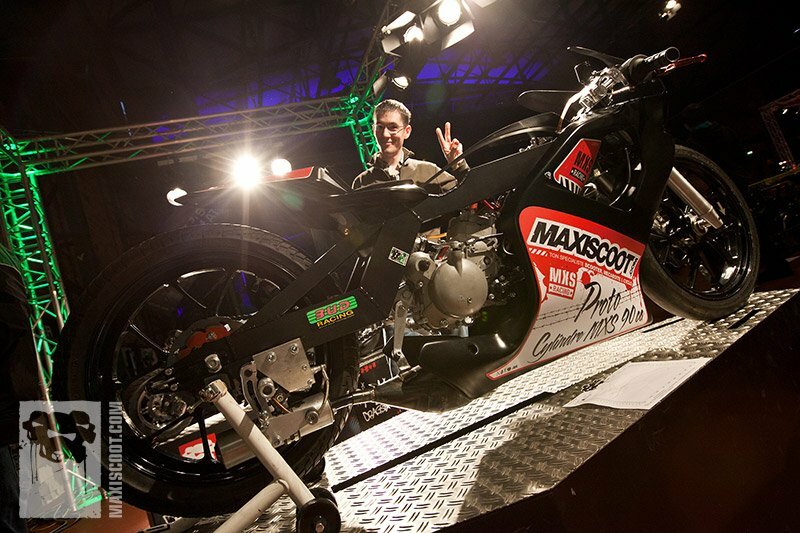 Fans and tuning freaks can have a detailed look at our baby at custom shows across Europe. If you are interested in seeing more photos of this extraordinary custom project, check our online magazine.